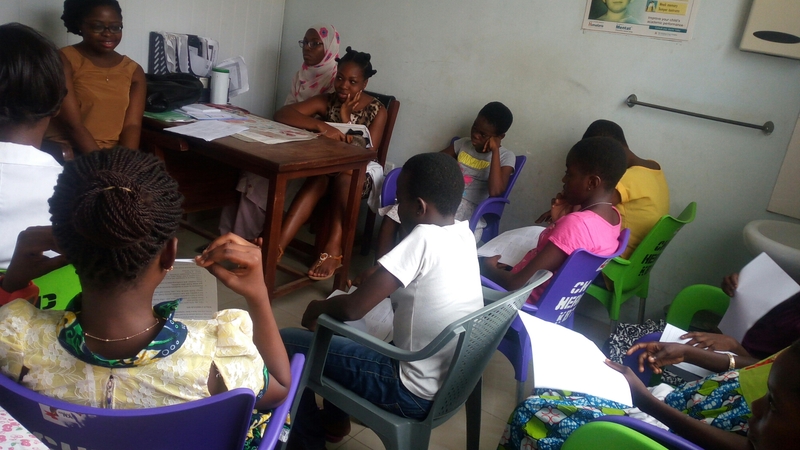 Dr. Buadu (Sickle Life) and Medical Students (facing camera) interacting with clients at the adolescent clinic. ​Living with a chronic medical condition is quite difficult for children and especially difficult through adolescence as young people transition into adulthood. We often begin to wonder why we are different, why us in particular, why so many medications to stay healthy, what happens if we do not take the medications etc. Widely known for experimentation, this period is a make or break for many. Some adolescents are generally less compliant on medication as they try to define themselves outside whatever medical conditions they live with. Still others, begin to engage in risky behaviour such as drug abuse and alcoholism as they express the autonomy that comes with leaving home to live in boarding schools/hostels. Adolescence is thus a crucial time to make a positive impact in the lives of person living with chronic medical conditions. This call is especially important in our setting where the narrative on chronic medical conditions is overwhelmingly negatives. Issues of stigmatization and abuse of persons living with chronic medical condition are quite common with harrowing stories of child abuse at the hands of faith healers in a bid to cure them or in some cases, parents opting not to educate their children living with conditions such as sickle cell disease because “these children die early and a person cannot recoup their investments in them”. For me and many others, mentors made a world of difference. The knowledge that we could achieve whatever we set our sights on despite Sickle Cell Disease led us to strive to be the professionals we are today. Mentors matter. Mentors matter to the child whose parents have refused to educate him because they expect that he’ll be dead in no time. Mentors matter. To the person who is going through hardship in Senior High School right now and wants to give up. Mentors matter. To the child who wants to be a teacher, lawyer, doctor, artist etc. but everyone around them tells them that people living with Sickle Cell Disease do not work. Mentors matter. To the child who wants to get married and have children in future but everyone around them asks whether they have seen a person living with Sickle a Cell Disease have a child before, Mentors Matter. Mentors matter to people like you and me. I know this because I have benefited from the influence of a mentor. Trust me when I say, Mentors matter. For the longest time, I operated under the assumption that I did not have a medical condition. Call it denial, but I called it positive living. I pushed myself to achieve whatever my colleagues could. Studied long hours, went jogging, played sports, volunteered to represent my school in sport contests etc. On some level, I knew there was a reason I was taking different medications daily. There had to be a reason I’ll be rushed to the hospital from school from time to time. There certainly was a reason I was never allowed to compete in athletics competitions though I was quite good. It never really hit me, till I was set to go to senior high school. Once, while in class 2, I had the realization that I was a little different because a colleague who was said to have what I had passed away, but that really didn’t make much of a dent in my life. See, in my attempt to go to senior high school to study science because I wanted to be a doctor in the future, everyone told my mom I couldn’t/ shouldn’t study science. Why pursue science when I had sickle cell disease? Science was too stressful and medicine even more. I should not bother with my dream. People like me did not study science. People like me certainly do not become doctors. Even in my choice of high school to attend, the same reasons were ascribed. I had to stay close to home. What if I fell sick? And when the decision was made to stay in Accra, the decision of which school to attend was not based on which was the best but again people had reasons why the best was not good for me, or maybe I was not good for the best, never mind that I had great grades and could go study wherever I wanted. SHS was such a difficult time, as you may have read in previous posts. I remember wondering at some point along the journey if the opinions were right. Was science really too difficult for a person living with sickle cell disease? Did people like me really not study science? At just the right time, my mom started mentioning a doctor who had sickle cell disease. This doctor had gone through all the challenges I was going through and was excelling in his field. She somehow orchestrated a meet-up between us. I remember being very shy and not wanting to interact with him because I was unwell at the time. He was such a pleasant fellow and told me a bit about himself. He asked about my challenges and shared his. I sat in awe watching this person who was just like me doing things everyone said people like us couldn’t. I cannot exactly remember, but I think I was finally able to put a name to the kind of doctor I wanted to be after that encounter. A Haematologist, just like him, that is what I wanted to be. Throughout medical school whenever we met we’ll chat about life in general and the challenges of living with a chronic disease. Do you know that even medical doctors who know the pathophysiology of their condition struggle with medication compliance? It was quite a relief to learn that I was not alone. He would talk about how difficult it all was but also made sure to emphasize that to be happy we had to make everyone else happy, even if it meant taking our medication when we didn’t feel like it. I was sold. Throughout medical school, whenever the road was tough, whenever I was unwell and begun to question whether people like me could purse medicine, I’ll remind myself people like me had and yes, I knew some of them. Some of these people had gone through worse and made it through. They had not just studied medicine but gone on to become consultants and I could too. They had overcome great complications, missed several days of school but still excelled, I could too. Mentors matter. This is why. Every single one of us can beat the odds. Every single one of us can go contrary to the narrative. We are not lazy. We are not a waste of money, we are not sickly, we are not dead or dying. We can be just about anything we want to be when given the right opportunities and exposure. It’s about time we got the word out. Mentors matter. Be a mentor to a child living with a chronic medical condition. Provide access to mentors for such children. Adolescence is where we can make or break them. Let’s work together to change the narrative. The Paediatric Sickle Cell Clinic at the Korle-Bu Teaching Hospital is headed by Dr.Cathy Segbefia, a consultant paediatric haematologist. The aim of this clinic is to provide comprehensive care for all children with Sickle Cell Disease to meet their medical , social and psychological needs. The adolescent clinic provides adolescent-centred out-patient services for children between 12 and 15 years in preparation for their transition to adult care. Join Sickle Life on our Mentorship project by volunteering as a mentor (Please click here) or donating toward this project. This entry was posted in Blog, News/media and tagged Adolescence, Ghana, health, Korle Bu, Mentorship, sickle cell disease, Sickle Life. Bookmark the permalink. ← Sickle Life Mentorship Project Volunteer Form.